IGP sacks four policemen over extortion, bribery – Royal Times of Nigeria. The Inspector General Of Police, Ibrahim Idris on Sunday sacked four officers of the Ogun State Police Command over extortion and bribery. The sacked officers are: Inspr. Mufutau Olaosun, Sgt. Adebayo Temitope, Cpl. Bakare Taiwo and Cpl. Adesoye Ayokunlehin. 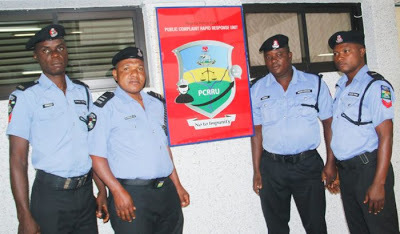 A statement from ACP Abayomi Shogunle, Assistant Commissioner Of Police, Public Complaint Rapid Response Unit (PCRRU), Nigeria Police Force, Force Headquarters, said the police officers were charged, tried and found guilty in an Orderly Room conducted at the Area Command Headquarters, Ijebu-Ode for two offences against discipline as provided for in Paragraphs E (iii) Discreditable Conduct and C (ii) Corrupt Practice, under the First Schedule of Police Act and Regulations Cap. P19. Laws of the Federation of Nigeria 2004. The statement said the IGP approved the dismissal of the officers, saying that there had been complaints through a petition to the police of how the officers forcefully collected money from someone who they accused of stealing a phone. The statement read: “On the 12th of June, 2017 the Public Complaint Rapid Response Unit (PCRRU) received a complaint via WhatsApp number 0805 700 0003. The complaint was immediately registered, Tracking Number PCRRU451591 issued and investigation initiated. The Divisional Police Officer (DPO) Igbeba Division, Ijebu-Ode was mandated to commence an enquiry straightaway. “The policemen were identified and it was discovered that they apprehended the complainant on 7th June, 2017 without any reasonable cause and extorted the sum of N50,000 “Bail Money” despite the #BailisFree campaign before he was eventually released same day. “The extorted N50,000 was subsequently recovered from these unethical policemen who were armed in plain clothes on the day of the incident. Their action is contrary to the directives of the Inspector-General of Police and unacceptable. Necessary disciplinary measures were initiated against the erring policemen, they were found guilty as charged in an Orderly Room trial after the presentation of witnesses and exhibits. “Punishment of dismissal from service was recommended by the Adjudicating officer and proceedings reviewed by the relevant Nigeria Police Force (NPF) authorities. The punishment of dismissal from service has been upheld with immediate effect and all NPF uniforms and accoutrements including warrant cards (ID cards) issued to the men have been retrieved with all dismissal procedures completed,” the statement said. It added that the complainant was also handed back his N50,000 with an apology a day after he lodged the complaint, adding that the elated man after receiving his money thanked the PCRRU, as he said: “Great job, you people are doing right there, thank you for the prompt response”. “Furthermore, the Inspector-General of Police, IGP Ibrahim K. Idris, while reiterating his stand on zero tolerance for corruption, vows to “flush out those tarnishing police image” from the Force. The IGP also impress it upon the PCRRU to ensure that all allegations of professional misconduct against the police are promptly investigated and officers found wanting in any proven case be made to face appropriate sanctions as stipulated by relevant laws,”.